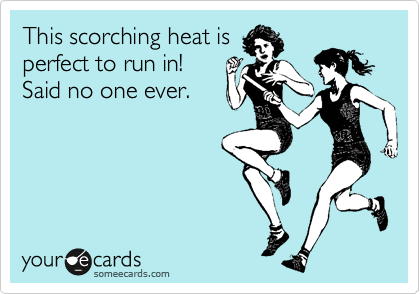 Haha…but somehow I convinced my brain that it would still be a good day to run..just do it! Get it over with, and you’ll be happy you did! That’s what I kept telling myself..and so I went. But you know when you’re just stinkin tired, at least I am, like, extra picky about what music to listen to on the run? I knew I couldn’t do anything too loud or obnoxious today; but I still needed that extra oomph to make sure I’d get all the way to the finish line! So I created this playlist, and it was perfect for this morning. Nothing too crazy, no annoying crazy-loud beats, but still enough drive to keep my legs moving! The first song is for a warm-up, and the last one is for a cool-down, and you can always skip thru the list to make it shorter if you want! I almost always make my playlists a longer amount of time than my workouts, just to make sure I don’t run out of songs! Running out of music makes for a sad day running. Haha, do you think it would freak somebody out if I did this? Pretty sure it would make my day! These playlists are so cool, and super easy to get on your phone, so you can take it along and give you a soundtrack to your next run, ride, or gym exercise session! Simply follow me on Spotify, and get the playlists on your Spotify Premium account right on your phone! What do you like to listen to while you exercise?